Of course! Deflect, deflect, deflect! I got a stupid Sandra Fluke/Sarah Palin graphic on my facebook newsfeed along with some commentary from the individual posting it. He was woefully misinformed about the real content of Fluke’s testimony and the purpose of it. I tried to politely tell him the real facts and even pointed him to some articles with the actual facts in them. I don’t think he’d even bothered to watch any of the testimony himself. He argued back for a short time and then just said “meh”. He couldn’t have cared less about the truth, he just wanted to rail against what he perceives to be liberals. You could be right, maybe left, being from the UK I could have said it in English, still happy from the jubilee celebrations, I find words confusing. I got into a “discussion” with a friend (of over 20 years) about a month ago in which he was just going off on Pres. Obama on his “socialist”-this and “socialist”-that programs. Just to poke the bear a little I asked him, “What’s wrong with socialism?” Apparently, one does not ask someone who freely quotes Bill O’Reilly “What’s wrong with socialism?” I personally have no stand one way or the other on the issue and, unfortunately, his arguments were all rhetoric, accusations and “beat-downs”. Needless to say the friendship will probably never be the same. Sad. Daniel, I accidentally put up a draft of an upcoming blog as part of this comment, which should have ended with the URL of the Scott Walker comment. Please delete the blog draft. Thanks. Thanks, Daniel. It will probably be posted some time next week, but I will have some political satire of my own in a few days. Good points. 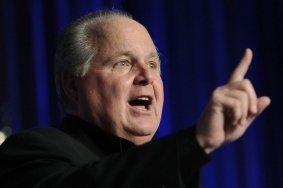 As a conservative, I was embarrassed by Rush’ fiasco on Fluke. It really sucked, and I never will defend his actions on this big fart. But, the country needs this guy right now in a big way. The country is sliding into socialism. Can’t allow this! I don’t see us sliding into socialism. I see the word ‘socialism’ blowing up so as to include a broad range of policies. People can disagree with Keynesian economics all they want, but it sure isn’tt socialism, and if the right wing were even minimally aware of teh difference, it would be much easier to keep Obama on track. As it stands, the national debate has nothing to do with the actual policies. We can’t even get to teh real disaggrement, because we are too busy sorting through the misinformation.